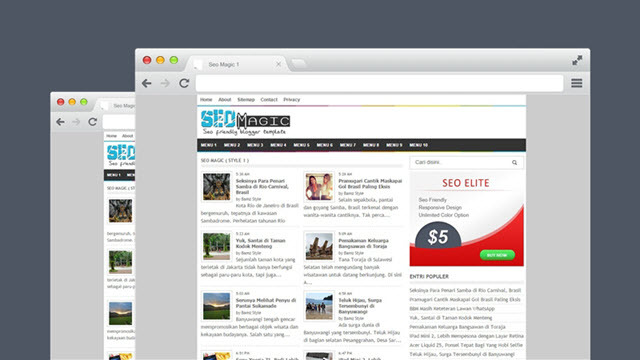 Description: SEO Magic Blogger Templates is one of the latest types of premium templates designed with 3 column layout, part of the post is divided into two columns and on the right there is one column sidebar widget. This template is packed with exciting features that will turn your blog into a more seo friendly, more powerful loading, and more optimal ad placement. You can place ads recommended Google is 728x90 and 300x250px. Post your yard can also place ads 336x280px size. Template Features : 100% Responsive, Post Thumbnail, SEO Optimized, Custom Tag Heading, Blogger Threaded Comment System, Dropdown Menu, Ads Ready, Post Snippet, Breadcrumbs Indexed Google, 3 Column Layout, Related Post With Thumbnail, Social Share Button, Compatible with major browsers, Simple admin layout, Bottom Widgets Ready, Page Navigations, Search Box Widget, See more features.